Reish indicates that he will focus on "Poole's Columbia sessions of 1926 and 1927 with fiddler Posey Rorer and guitarist Roy Harvey. Transcription and analysis of selected passages demonstrate how the interplay of Poole's three-finger banjo technique, Rorer's blues-inflected fiddling, and Harvey's sophisticated fingerstyle guitar runs produced an intricate composite sound that moved beyond the conventions of traditional string band music and anticipated some of the ensemble complexities of bluegrass." Reish's detailed knowledge is always impressive plus he adds a great deal to the informal ICMC picking sessions. The ICMC has covered many bluegrass artists and those that had a significant influence on the genre as it evolved. Charlie Poole was certainly in that category. 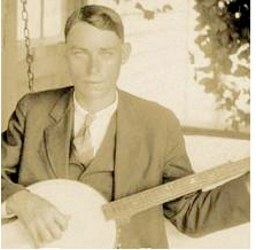 The impact of Charlie Poole in the early years of 3 finger style banjo is certainly heard today in old-time and bluegrass music. A new ICMC participant, Irwin Streight of the Royal Military College of Canada in Kingston, Ontario will be discussing "Mary Gauthier: Songs that Will Clear a Room." Streight indicates that his analysis takes its critical purview on Gauthier's work from a statement by Southern short story writer Flannery O'Connor, who has had a considerable influence on Gauthier's artistic vision and practice. Writes O'Connor, "It is the extreme situation that best reveals what we are essentially." Like O'Connor's fiction, Gauthier's songs deal with the extremes of experience that reveal our true humanity. As Gauthier puts it, "We're both willing to clear the room." Her songs feature characters who live precariously (hobos, street people living under a bridge, an AIDS victim, an alcoholic), often violently (a prisoner on death row, a suicide, an angry person with a gun), and frequently in a state of existential despair (an abandoned child, a rejected lover). Gauthier's tightly-crafted song narratives have the telling detail and gesture that, like a good short story, reveal character and signal the mysteries of personality. Indeed, in reference to the explorations of character in her songs Gauthier has remarked, "The mystery deepens as I go further as a songwriter." Independent scholar and country artist Caroline Gnagy of Austin, Texas will be presenting "The Welded Chain That Binds Us: One Family's Journey From Prison Cell to Opry Stage." Gnagy's presentation will deal with 87 year-old ex-convict Tom Cook from Chestnut Mount, Tennessee who "ran moonshine for the East Coast mafia as a young man, and consequently served two 3-year terms and part of a 5-year prison term in various penitentiaries in the 1950s and 1960s. He is fast-talking, charismatic, and the father of Nashville-based Grand Ole Opry star, Elizabeth Cook." Gnagy will discuss Tom Cook's experience in a country prison band as well as his impact on daughter Elizabeth Cook's country music career. Chris Wilson of the University of Toronto will be providing yet further insight into the songwriting process in his ICMC 2012 presentation "I Got Three Hours Next Tuesday Morning: Co-Writing on Music Row and the Strategic Responses of Nashville Songwriters." Wilson "explores songwriters responses to the imposition and challenges of co-writing in order to get their songs cut." He indicates that co-writing "has become standard operating procedure for songwriters on Music Row. The expectation of collaboration with other songwriters is a definable example of how Music Row affects songwriters' strategies, particularly given that co-writing was an unfamiliar process for many songwriters prior to their arrival in Nashville. Writing with younger performers, increasingly more common on Music Row, elicits responses ranging from contempt to enthusiasm from established songwriters who are expected to collaborate with and share songwriting credits with more novice songwriters." ICMC is pleased to have this significant dimension of ‘the business' explored in depth. Distinguished presenter Patrick Huber of Missouri State University will be discussing "Black Hillbillies: African American Musicians on Old-Time Records, 1924-1932." The late Charles Wolfe would be VERY pleased as he felt the African American aspect of country music needed a great deal of work. Huber indicates that he will examine "those black musicians who performed on hillbilly records before 1933, as members of integrated groups, as accompanists, or as racially cross-listed artists, and discusses what their presence of these records can tell us about the hillbilly recording industry during this formative period."